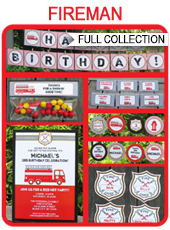 Choose from over 120 different party themes! Create a professional party in minutes! Here you will find all the printable invitation and decoration templates you need. No more procrastinating – download now & personalize the editable templates easily yourself at home using the FREE Adobe Reader. Full instructions are included for editing, printing & assembly – so you’ll always know what to do.